Braces, also called orthotics, are made from a variety of materials such as elastic cotton/nylon, foam rubber, and molded plastic. An orthotist is a medical professional that specializes in making custom molded braces, adjusting their fit, and providing tips for comfort and proper wear. It's important to follow your doctor's specific instructions for when and how to wear your braceespecially when sleeping, showering, and during certain activities. There are two types of neck braces: soft and rigid. 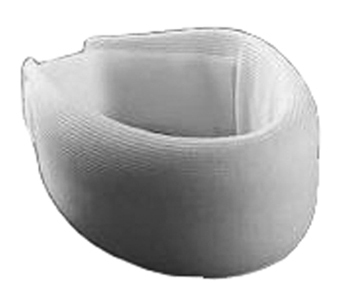 A soft cervical collar is made from thick foam rubber covered in cotton. It is used to support your neck and control pain after an injury (e.g., whiplash). Rigid braces are made from molded plastic with a removable padded liner in two piecesa front and back piecefastened with Velcro. 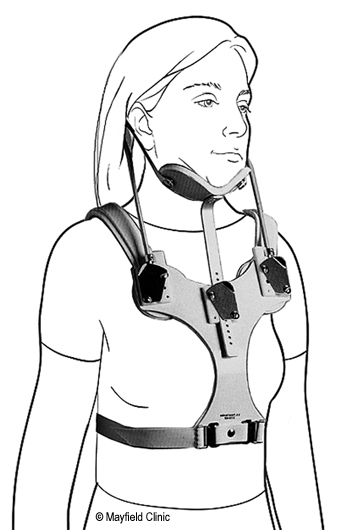 This brace is used to restrict neck movement during recovery from a fracture or surgery (e.g., fusion). Common rigid braces are the Philadelphia collar and the Miami J collar. Know how to apply your brace before leaving the hospital. Wear your brace all the timeeven during sleepunless otherwise instructed by the surgeon. You will wear the brace until your spine has healed or fused, which may be as short as 4 weeks or as long as 4 to 6 months. Begin by lying flat on the bed. 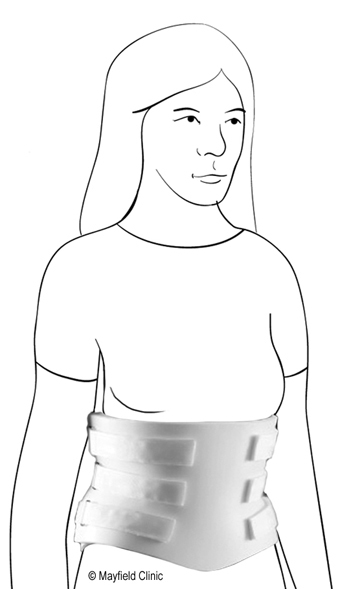 Slide the front half of the brace up your chest wall until its firmly under your chin. If present, attach the elastic strap behind your neck to the other side. Apply the back half of the brace in the proper position on your neck. Fasten the Velcro straps tightly. Wash and deodorize your brace with a mild soap and damp cloth every day. If your brace has padded liners, let air dry or use a hair dryer on "cool" setting. Your brace will restrict your ability to move. Youll not be able to see your feet, so take care when walking. Avoid extreme bending and twisting of your spine. When moving from a lying to a standing position, use your arm and leg muscles to keep your spine in proper alignment. Follow your doctor or physical therapist's instructions about exercise. You should postpone sexual activity until your follow-up appointment unless your surgeon specifies otherwise. Also, do not drive. When riding in a car, do not ride in the front seat with an air bag. Follow your doctors instructions for when you may remove your brace to shower and shave. Wash your hair with dry shampoo products until your incision has healed. Afterward you may shower and wash your hair with the brace on. After showering, lie on a bed and have someone remove the bracedo not move, replace the padded liner with a dry one, and reapply the brace. Watch for reddened or broken skin under the brace. Skin breakdown can be caused by rubbing, pressure, or moisture. This may indicate that the brace does not fit properly or is not being worn properly. An orthotist can adjust the fit and provide tips for comfort and proper wear. If your brace feels loose, keeps riding up, is painful, or you have reddened or broken skin under the brace, call the orthotist for an adjustment. The orthotist will also provide more liners for the brace. Neck (cervical) and upper back (thoracic) injuries require a special cervical-thoracic brace to restrict neck and upper back movement after an injury or neck fusion surgery. This rigid brace has a plastic padded chest jacket in two piecesa front and back piecefastened with Velcro straps. Supports for the chin and back of the head arise from the chest jacket. You may find that a Minerva brace is uncomfortable to sleep in, so your surgeon may allow you to sleep and shower in a Miami J collar. Follow your surgeons specific instructions on when and how to switch between the two braces. Always remove and apply the braces lying on a bednever sitting or standing. Apply your cervical-thoracic brace before getting out of bed. Begin by lying flat on the bed. If youve slept in a Miami J collar have someone remove it. Separate the two pieces of the brace. Log roll onto your side, keeping your shoulders, hips, and knees in a line. Apply the back half of the brace in the proper position on your neck and back. Carefully log roll onto your back and into the brace. Apply the front half by sliding it up your chest wall until its firmly under your chin. Fasten the Velcro straps tightly starting at the bottom and working up. Wash and deodorize your brace with a mild soap and damp cloth every day. If your brace has soft padding, then a hair dryer set on cool will help dry the inside. Your brace will restrict your ability to move. Youll not be able to see your feet, so take care when walking. Avoid extreme bending and twisting of your spine. When moving from a lying to a standing position, use your arm and leg muscles to keep your spine in proper alignment. Follow your doctor or physical therapists instructions about exercise. Follow your surgeons instructions for removing the brace to shower and shave. Wash your hair with dry shampoo products until your incision has healed. After the incision heals you may shower and wash your hair in a Miami J collar. Follow the steps above for removing and applying the braces. After showering, lie on a bed and remove the Miami J, replace the padded liner with a dry one, and re-apply the cervical-thoracic brace. Watch for reddened or broken skin under the brace. Skin breakdown can be caused by rubbing, pressure, or moisture. 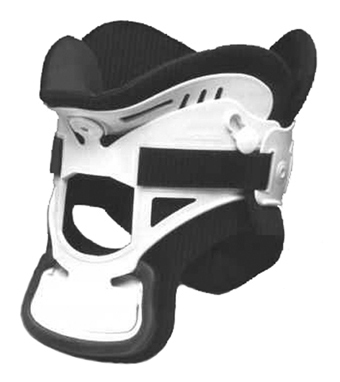 This may indicate that the brace does not fit properly or it is not being worn properly. An orthotist can adjust the fit and provide tips for comfort and proper wear. To apply the halo, your doctor will give you an injection of a local anesthetic. Four pins are placed equally around your skull and attached to the halo. Most people dont feel pain from the pins being too tight; rather, loose pins commonly cause pain. Once you are in the halo ring brace, x-rays are taken to make sure your spine is positioned and immobilized correctly. You will wear the halo ring brace day and night for about 3 to 4 months. An orthotist will schedule appointments every 2 to 3 weeks to check your brace and pin sites. Use cotton swabs (Q-tips) with soap and water or hydrogen peroxide to clean the skin around the pins twice a day. Do not use ointments or antiseptics unless your doctor tells you to. Gently push the skin away from the pins to avoid adherence and reduce scarring. Minimize discomfort at the pin sites by using the pain medication prescribed by your doctor. Thereafter, pain is managed with acetaminophen (e.g., Tylenol). Do not loosen or tighten the pins or straps. Do not allow anyone to lift you by grasping the rods. Do not dye or color your hair. Do not drive. When riding in a car, do not ride in the front seat with an air bag. Clean the area around your vest everyday. Clean the skin under the vest with an alcohol-moistened towel every 2 or 3 days. Do not use soaps, lotions, or powders under your vest. Do not take a shower  use sponge baths to clean the rest of your body. Wash your hair with dry shampoo products or tuck a towel around your neck and lean over a sink, but do not get the vest wet. Your brace will restrict your ability to move. Youll not be able to see your feet, so take care when walking. Avoid extreme bending and twisting of the spine. When moving from a lying to a standing position, roll onto your side and use your arms to push yourself to a sitting position before standing up. Sleep may be more comfortable in a semi-reclined position with a rolled up towel placed under your neck. Follow your doctor or physical therapists instructions about exercise. If you have loose pins (ability to nod your head); soreness, infection or drainage from pin sites; or reddened, broken skin under the brace. Call the orthotist for an adjustment. There are two types of braces: flexible and rigid. A flexible brace is made from an elastic cotton/nylon material and is most commonly used to support your back when lifting, improve posture, or relieve low back pain. This brace is similar to a girdle or corset. Rigid braces are made from molded plastic in two piecesa front and back piecethat fasten together. This type of brace is used to immobilize your spine during recovery from a fracture, spinal surgery, or correction of scoliosis. Common rigid braces are the Thoracic Lumbar Sacral Orthosis (TLSO) and the Lumbar Sacral Orthosis (LSO). 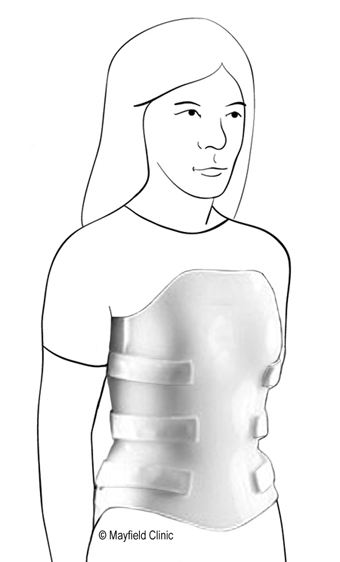 To be fitted for this type of brace, a plaster cast is made of your torso by an Orthotist. From this cast a rigid plastic brace is custom molded to comfortably fit your body exactly. Know how to apply your brace before leaving the hospital. Wear your brace all the time, unless otherwise instructed by the surgeon, until your spine has healed or fused, which may be as short as 6 weeks or as long as 4 to 6 months. Remove the brace only to sleep. Put the brace on before getting out of bed. Apply your brace before getting out of bed. Begin by lying flat on the bed. Apply the back half of the brace in the proper position on your back. Apply the front half of the brace. You may loosen the Velcro straps slightly while eating. Wash and deodorize your brace with a mild soap and damp cloth. Rinse and let the brace dry. If your brace has soft padding, then a hair dryer set on cool will help dry the inside. Your brace will restrict your spines ability to move while still allowing you some mobility, such as walking. However, you should avoid bending and twisting of your spine. When moving from a lying to a standing position, roll onto your side and use your arms to push up to a sitting position before standing. Follow your doctor or physical therapists instructions about exercise. Postpone sexual activity until your follow-up appointment unless your surgeon specifies otherwise. Do not get the brace wet. If the liner gets wet, you can dry it with a hair dryer on "cool" setting. Follow your doctors instructions for when you may remove the brace to shower. Wear a T-shirt under your brace to prevent pressure sores. If your brace feels loose, keeps riding up, is painful, or you have reddened or broken skin under the brace, call the orthotist for an adjustment. dry shampoo product: any kind of oil-absorbing powder that is brushed through the hair to cleanse it without wetting it. lumbar: lower portion of the spine made up of 5 vertebrae; connects with the fused bones of the sacrum below. orthotist: a medical professional who specializes in making custom molded braces. sacral: the five vertebrae at the base of the spine that provide attachment for the iliac (hip) bones and protect the pelvic organs. thoracic: middle portion of the spine made up of 12 vertebrae. We strive to manage patients as conservatively as possible. Physical therapy strengthens back and stomach muscles. Spinal injections temporarily reduce inflammation and relieve pain. If conservative therapy is not successful, we help patients with surgery.